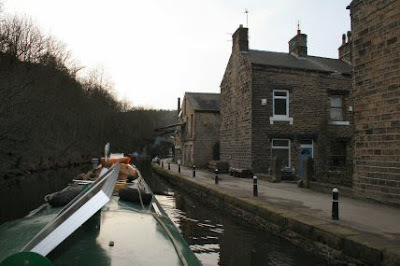 Leaving Mytholmroyd and the first of the locks come into view. Its back out into the countryside and there are hills everywhere. 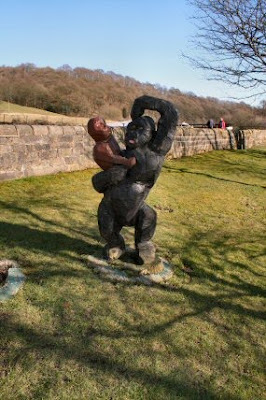 At Broadbottom lock and for some unknown reason there is a carving of a gorilla by the side of the lock. What it is supposed to represent I do not know and I find it hard to come up with a link to the canals. 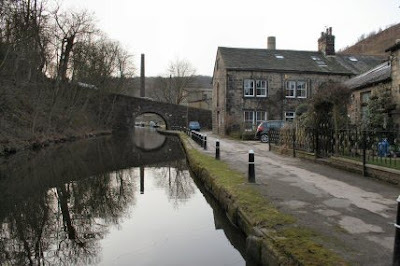 At bridge 14 there is a road sign saying we are entering Hebden Bridge. 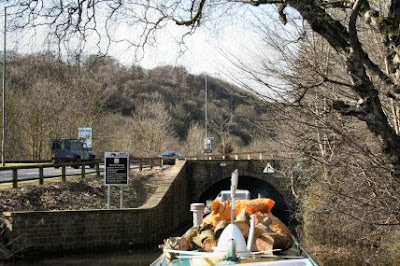 The skew bridge is more of a tunnel really. It seems longer than the one at Tuel Lock and there is a longer curve going to the right and without lights. Its no problem if its taken steady. 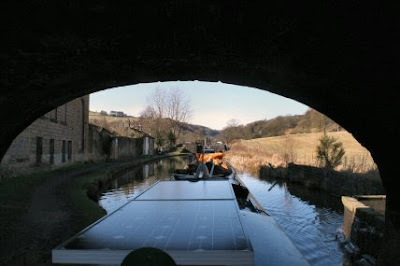 The other side of the tunnel and the first of the moored boats line the bank all the way in the Hebden Bridge. 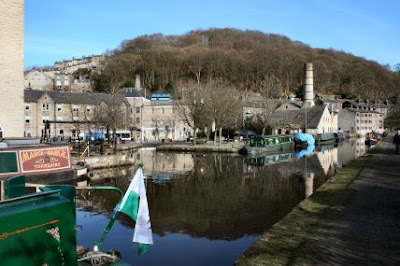 Hebden Bridge basin and we stop here to pick up water. The towpath here has some misleading signs. The first one says its the start of the 24 hour mooring, the second says strictly no mooring and the last one says that is the end of the 24 hour moorings. The no mooring sign is only for the winding hole but it doesnt say that. 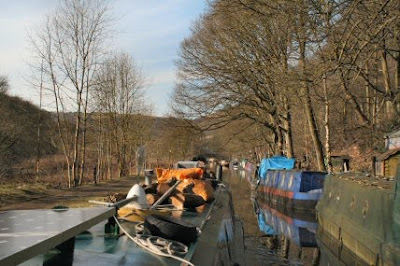 Moved through the third lock of the day as there is a 48 hour mooring just above it. A lovely area and we moor up right outside the Alternative Energy Centre. I shall be having a good look at that tomorrow to pick up tips. The view from the bows. Its likely to be the view for some time.